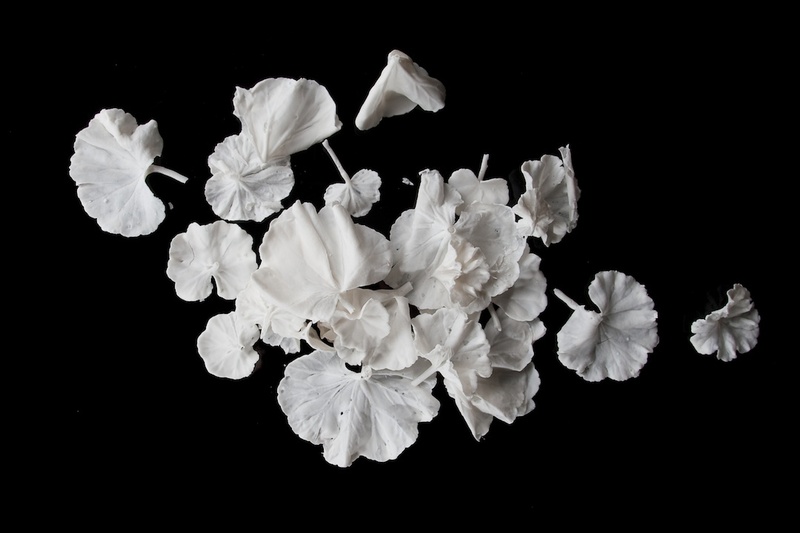 Jasmine Targett’s white geraniums are compellingly tactile, and serenely beautiful. 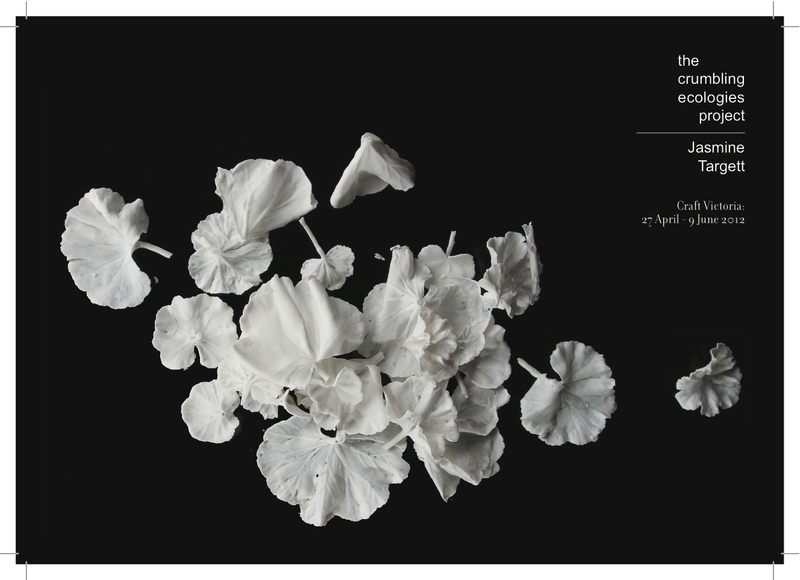 However, in addition to their elegance, the crisp porcelain leaves are persuasive and political. Among the images that decorate Jasmine’s studio space is a picture of a ‘yarn-bombed’ tree. Yarn-bombing sits within an emergent trend for craft-ivism or arts activism, where small interventions using artisan skills and techniques are executed to highlight political and cultural issues. 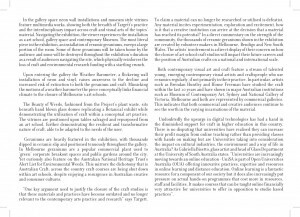 While yarn-bombing has conventionally been a site specific enterprise performed in the urban landscape, Crumbling Ecologies translates the concept of craft-ivism into the art gallery. Targett demonstrates the legitimacy of art-activism as an art form, by placing her own political porcelain within a traditional white gallery space. Targett’s practice has previously married the realms of art and politics in her Life Support Systems glass works (2011), and Antarctica, Dissolving Perception (2009). 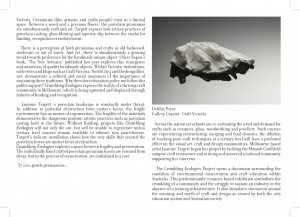 These projects exploited the transparent material quality of glass, to succinctly create an exposé of contemporary environmental issues. Both aesthetically, and as an act of art-activism, the Crumbling Ecologies Project draws parallels with Chinese artist Ai Weiwei’s Sunflower Seeds installation. 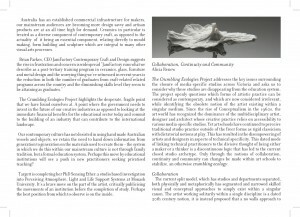 The two works comment on mass production and consumption, and are constructed from individually crafted elements. The sunflowers seeds and geraniums represent an investment of time, material, craftsmanship, handwork of different creators, as well as the snowflake-like individualism of the leaves themselves. While Weiwei highlights that his work is ‘Made in China,’ Crumbling Ecologies is explicitly and intentionally a local production. 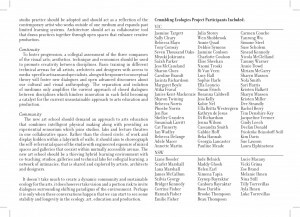 The enthusiasm of volunteers, from both within and outside the arts community, validates Targett’s central thesis: that the practices of porcelain, glass and textiles artists are valued, deserving of support and the opportunity for ongoing development. 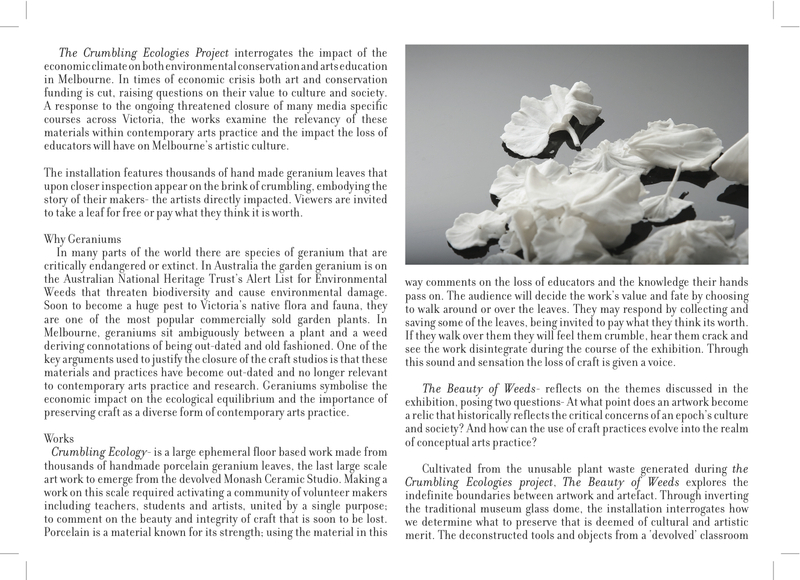 Crumbling Ecologies exploits this contradictory but co-existing message to articulate the current relationship between art and ‘craft’ within Victoria. Geraniums (like artisans and crafts people) exist in a liminal space. 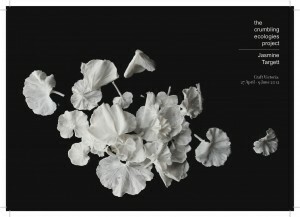 Between a weed and a precious flower, the porcelain geraniums are simultaneously craft and art. 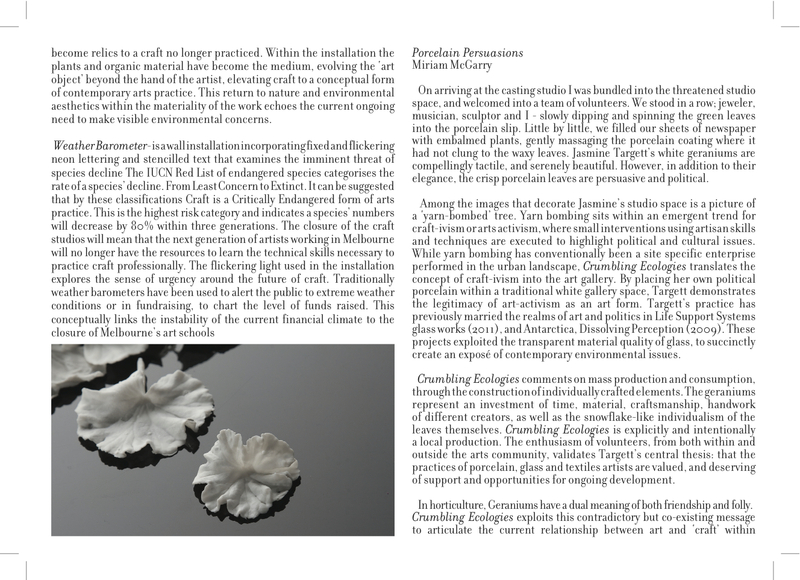 Targett exposes how artisan practices of porcelain casting, glass blowing and tapestry slip between the cracks for funding, recognition or endorsement. There is a perception of both geraniums and crafts as old fashioned, irrelevant or out of touch. And yet, there is simultaneously a growing trend towards preference for the handmade unique object. Oliver Supon’s book, ‘The New Artisans” published last year explores this resurgence and awareness of quality handmade objects. Within Victoria, institutions, collectives and blogs such as Craft Victoria, NorthCity4 and thedesignfiles.net, demonstrate a cultural and social awareness of the importance of sustaining these traditions. Why then does education policy not follow this public support? 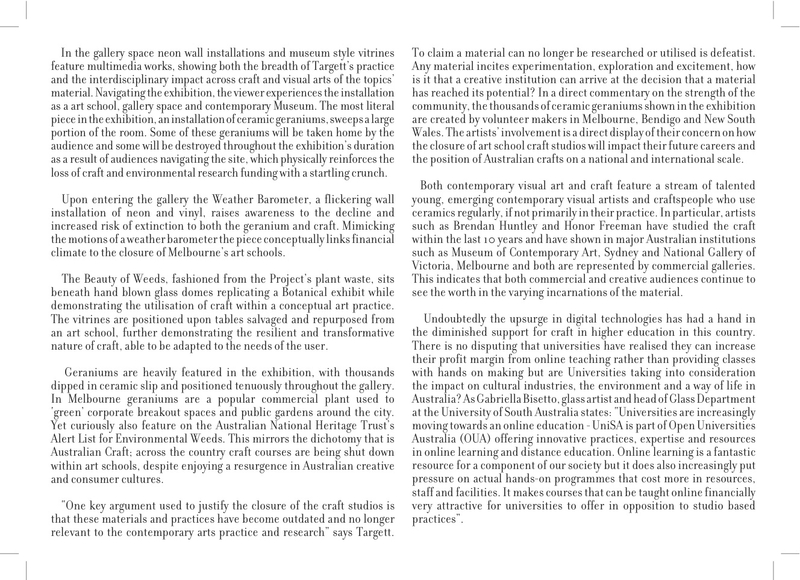 Crumbling Ecologies exposes the reality of a thriving craft community in Melbourne, which is being uprooted and displaced through failures of funding and recognition. 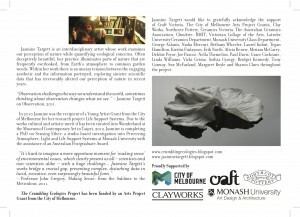 Jasmine Targett ‘s porcelain landscape is constantly under threat. In addition to potential destruction from visitor’s boots, the fragile environment has no means of regeneration. The fragility of the materials demonstrates the dangerous position artistic practices such as porcelain casting hold in the future. 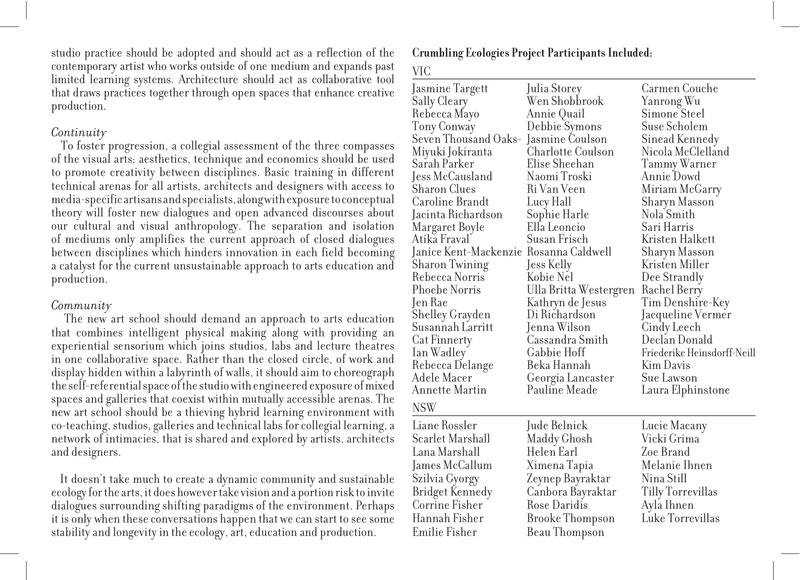 Without funding, projects like Crumbling Ecologies will not only die out, but will be unable to regenerate unless tertiary level courses remain available to educate new practitioners. Targett’s delicate installation shows how the very skills that created the porcelain leaves, are under threat of extinction. 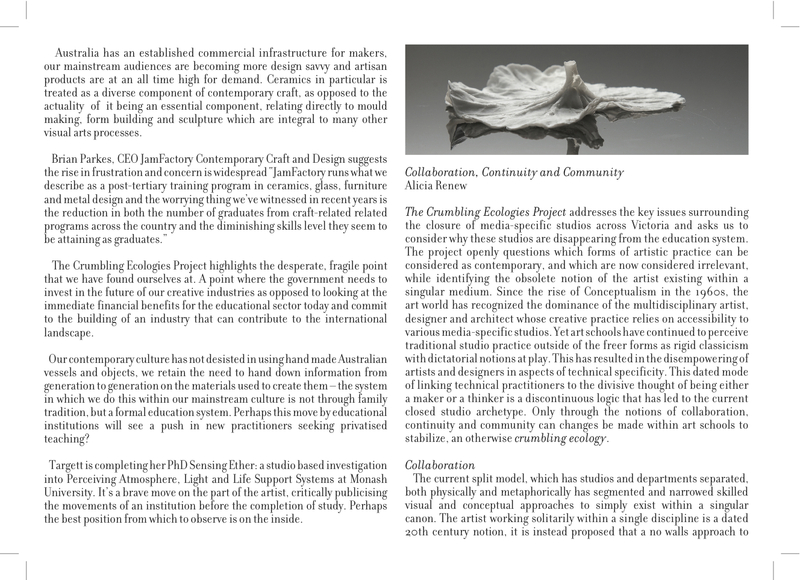 Crumbling Ecologies explores a space between fragility and preservation. The individually hand crafted porcelain geranium leaves are rescued from decay, but in the process of conservation, are embalmed in a cast. 37 000 gentle persuasions….